How to Care for a Dental Crown? Your new crown will increase your overall health and instill confidence for years to come with proper care. And “proper care” isn’t too hard to come by! Be sure that you brush twice daily with fluoride toothpaste and give a little extra focus to the gums. When possible, avoid directly chewing hard food and ice with your crowned teeth. Remember to schedule routine checkups with us so we can ensure that the crown remains in place and provides full dental protection! Crowns vs. Bridges vs. Implants: Which Do You Need? A dental crown, or “cap,” covers a tooth from all angles with a porcelain or metal (or combination of the two) material. They are necessary if a patient has a cavity that has grown too large or if a tooth has fractured or is at severe risk of fracturing. A crown is often required after root canal surgery on molars to decrease sensitivity. If the tooth is too damaged, it may have to be removed completely. This is where a dental implant can be inserted into the bone to replace a missing tooth (or multiple teeth). Another option for replacing a missing tooth is the dental bridge. Think of it like having two crowns with a fake tooth anchored in between the two crowns. Read more about dental bridges here. 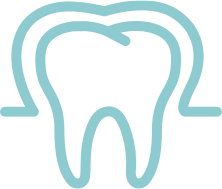 For more information regarding dental crowns, get in touch with Magnolia Dental today!